A devastating hurricane destroyed the fishing and gambling industries at the Atlantic seaboard. You are given the assignment to restore the fishing, hotels and casinos. You have 6 years to complete. 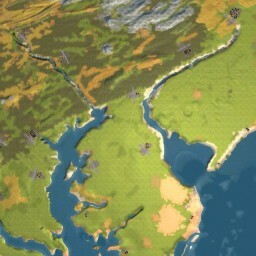 This is small 10 X 10 map. It should appeal of folks who like to build railroads. Money will be plentiful but to get the different goals you will have to rearrange the rails mid game unless you have a powerful enough computer. I try to keep the rail mileage under 4000 miles and the trains under 10. I wish there was a scenario condition to limit the trains and rail length. Great site and excellent idea consolidating all the SMR maps here! Sadly, this particular map doesn’t work for me. It crashes at startup every time. I’ve had no probs with any other maps on the site and I am putting it in a clean user maps folder. Is there an inherent glitch in this one? I will try and fix the map when I get to my main computer. Ok I’ve uploaded a new version that should fix the error, turns out the older version was missing quite a few assets. Thanks for the quick action on this! I played through right up until the completion screen then it crashes. I tried going back a couple of saves and trying again and it still crashes trying to load final screen, otherwise it ran through perfectly. A really fun scenario though! Well thats good to hear, except for the last bit though. Unfortunately I cannot think of any way to fix the last bit, it may be that Jancsika did something odd to the victory screen. It likely would help him if you brought the bug to his attention in the thread I linked to, make sure you mention that you got the version form here. I think the Events file was at fault. Made the corrections, and hope this will take care of it.